Meet via Google hangouts with me and five other intermediate researchers every other week for sixteen weeks and watch your skills grow. You’ll have access to a webinar introducing each topic to view prior to each session. During our one-hour session you’ll practice new skills and be able to ask questions specific to your research. The study group sessions will be held every other week. Times are 1:00 pm MT and 7:00 pm MT. Only sixteen participants will be included (8 per time slot). Category: Study Group. Tags: Research Like a Pro, Study Group. Even though I’d considered myself a novice at the research component of family history, I jumped in! ( My experience was mostly with Family Search & Ancestry). The information is presented in a clear & understandable format, with plenty of examples & opportunities to ask questions as I worked on assignments. I loved learning from other members of our group. My knowledge and desire to continue have grown far beyond expectations. I’m excited to review and put into practice all the best practices that were shared during this study group. This was one of the best investments I’ve ever made. I came to the class with two goals: to learn more about online resources and to become more efficient at family history research. The information and guidance presented exceeded my expectations. Each class was structured in a logical order and presented in easy to digest pieces. The assignments gave us practical experience in applying the theories and strategies presented. Diana was generous in sharing her knowledge and constructive and positive with her feedback on our assignments. My only regret is that I didn’t take this class sooner! 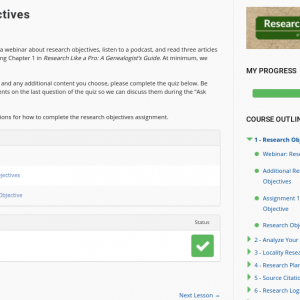 Research Like A Pro was an excellent value for money. It provided the opportunity to focus on a particular research objective, then approach that objective in a logical useful manner, leaving no stone unturned. The oourse is an antidote to haphazard searching and, if practiced, will certainly help researchers either break down difficult genealogical problems or let them know that they have done all they can by having conducted an exhaustive search and examined many resources. The hangouts were an interesting part of the process because they allowed the group to establish connections face-to-face. The whole study group was well organized and thought out and it provided a process that I will continue to use. Thank you, Diana. I have been researching for years and knew something was missing but I was not sure what. I had attended many classes and seminars although the information was good it never quite fit. Then I took the Research Like A Pro class and it all came together. I now have a workable plan for any research that I plan to do. I feel more productive and can document why I came to the conclusion I did. I have always known the importance of planning your work and working your plan but now I know how to make it all come together. I cannot say enough about this class. As a beginner to Genealogy it gave me a process to do my research. Diane is an amazing teacher. Her explanation of the steps was easy to follow and understand. I had never used Google Drive or Hangout. They are great products for an interactive online class. I enjoyed the interaction with my class mates. Following their research projects and seeing their comments about gave me a better understanding of the process and of good research. If you are struggling with your research I highly recommend this class. It is well worth the time and money. I have been doing genealogy research since the mid 1990’s. I have taken a few genealogy classes. I follow Diana’s post on this website. I bought and read the book Research like a Pro. I took the class. I am really glad that I took the class. I learned a lot taking this class. I learned about writing an objective so that I can stay focused on my research. I learned about locality guides and will do a locality guide for any new places that I research. I learned about research logs and why they are necessary. Everybody in the family trees that I research will get a research logs. I learned about all of the resources available to me. I will be more productive and won’t be repeating research. Diana is very informative. It was a very organized class. The time between the lecture and the assignment due date was appropriate. I would recommend this class for anyone wanting to become a better genealogist. What a great class. It helped me see where I was spinning my wheels and what I needed to do to create forward momentum instead. This process takes more discipline than I would like to use but I can see that I need it and will have better results when I use the process. Research Like A Pro Study Group was an amazing experience. It helps you better organize yourself and expands your knowledge of how to research. Diana’s approach is well organized and easy to understand. Her examples are easy to follow. She walks you through the steps in the RLP book. I am no longer fearful of source citations, research logs and analyzing information. Anyone who wants to move forward from searching for ancestors to RESEARCHING ancestors, this is the course for you! 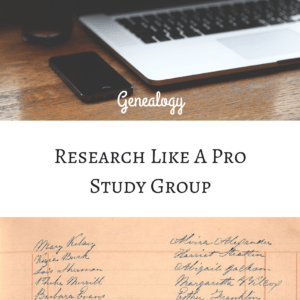 If you would like to improve your genealogy research skills, then the Research Like a Pro Study Group is a must. Diana’s book, “Research Like a Pro” breaks down all the necessary steps for research into very manageable chapters. Each session of the study group requires some preparation in advance: reading a chapter of the book, watching a video/podcast, reading a few articles, and completing an assignment for that section of the book. Members of the study group meet via Google hangout every two weeks. Diana is available to answer questions during the hangout, and you can email your questions to her between the sessions, to be answered during scheduled office hours. Topics covered include: creating an objective for your project, creating a timeline and analysis of your evidence; research planning, source citations, research logs, and report writing. 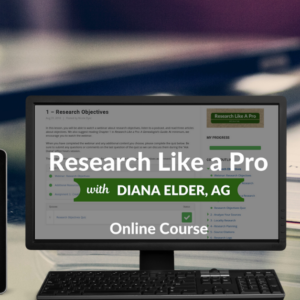 Diana is very helpful and shows you that you CAN be successful in improving your research skills using the Research Like a Pro method. This study group is chock full of information. One thing I liked about it is that there was a deadline for the assignments which helped keep me on task. Also, giving and getting feedback from other members from the group is helpful in that in might give you ideas for your own research or help someone else with ideas for theirs. All in all, I believe it is worth the time and money for this study group. Even though I’ve been researching for 20+ years, this class greatly improved my skill and knowledge of the research process. Diana has created a process that is well organized and designed to support learning. I am hoping by using the process I can slow down and improve the quality of my research and make it more enjoyable. All of her tools/templates are easy to use. Each session is full of useful information. Every researcher should take this class! After going in the same circles, looking at the same resources and repeating the same research over and over, and then becoming frustrated because I was expecting to see something different, I realized that I had to do something to help myself. Signing up for Diana’s Research Like a Pro Study Group was the best decision that I made in 2018! Diana has a sound research process that has group members learning techniques and actively researching their ancestors in a safe and supportive environment. The course utilizes Diana’s book, Research Like a Pro, slide presentations, interactive sessions, podcasts and numerous additional resources all designed to guide and assist participants. I am so happy that I enrolled. This course has made me a better genealogist! Thank you Diana and Nicole!